Normally $159. Save $100 on our remaining inventory. Lifetime Warranty. 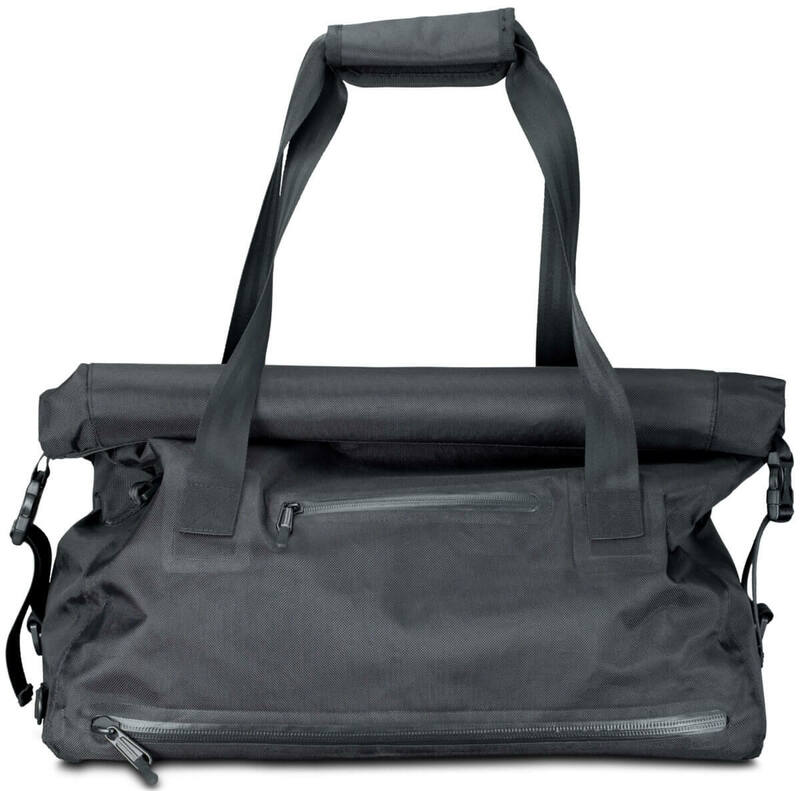 The Weekender is designed to expand as you need more room and contract as you don't. We sometimes travel with it empty to welcome surprises. Use the included padded shoulder strap or just toss the straps over a shoulder. Pull out the optional laptop sleeve to use as a minimalist computer bag. We love these bags but it's easier to focus on our core products, so we're retiring them. When they're gone, they're gone. 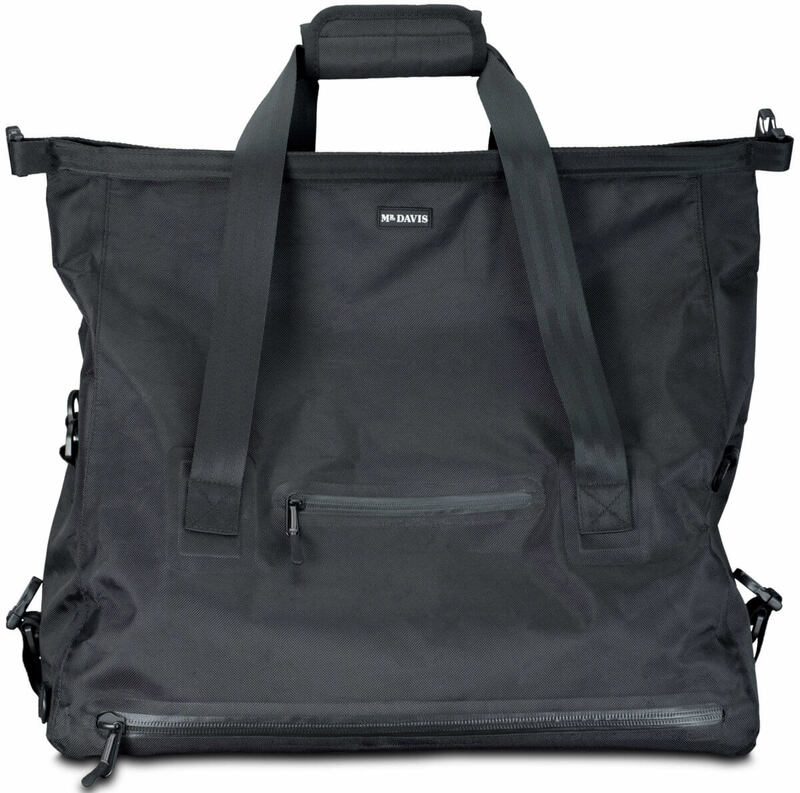 Versatile Capacity: Both big AND small, the Weekender expands or contracts as you need it. Roll down for a small carry-all or go big to haul a day at the beach. Water Resistant Lining: Wet bathing suits? No problem. 6 pack of beer? Even better. Produce from a farmer’s market? That works. Sweaty gym clothes? We got you covered. And sometimes you just need to carry weird stuff. Built for Laptops: Integrated laptop sleeve with sealed zippers will keep your laptop safe and dry. 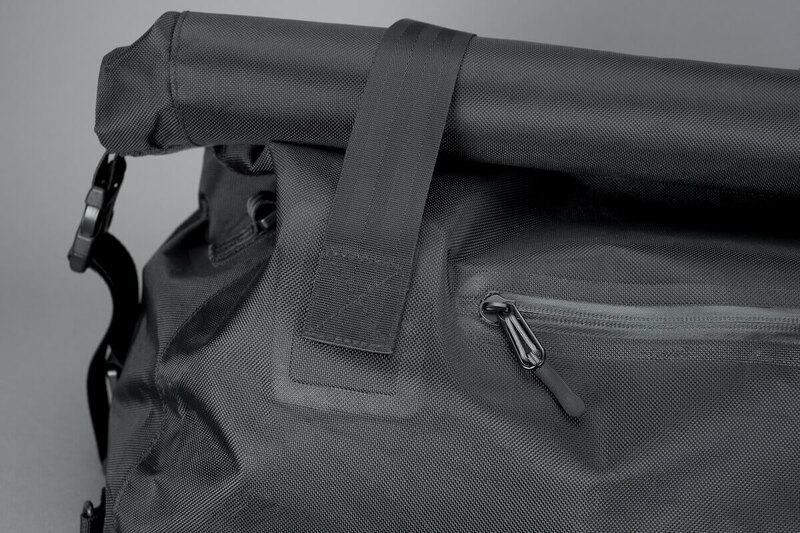 Built to Last: Built from tough 840d Ballistic Nylon with PVC backing and 5 bar seatbelt webbing, you’ll be giving this bag to one of your kids. Speed + Comfort: The shoulder straps is built with neoprene padding for comfort. The wide open mouth is easy to pack so you can head out in a hurry. Just Super Useful: Honestly we don’t know how else to say it. We didn’t plan on making this bag, but we loved the prototype so much we couldn’t help ourselves. We love it and know that you will too. It's the bag you didn't know you needed. You'll use it almost weekly. How much can the Weekender carry - how big is it? 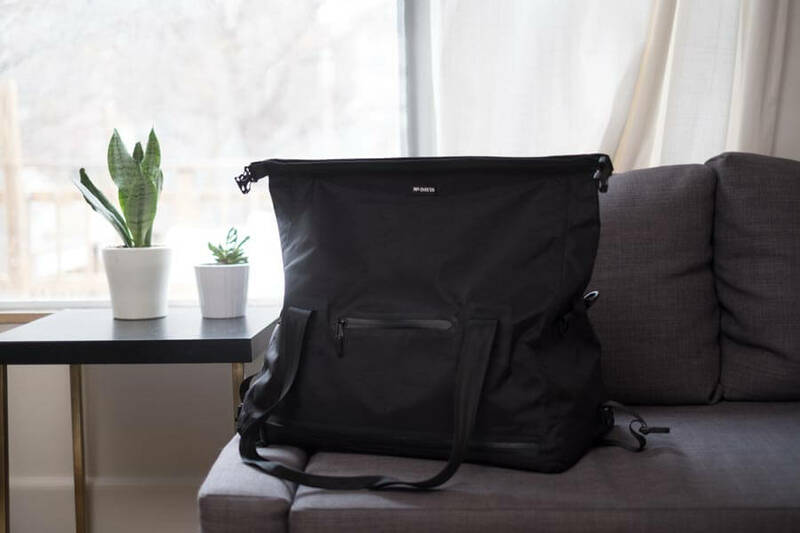 The Weekender easily handle a a quick overnight trip, but it can also expand to do a week. We sometimes take it with us on trips when we know we’ll be bringing stuff back. Maybe your wife hits Costco pretty hard and you need a place to stash a couple hundred CLIF Bars. Maybe you need to carry like 100 towels to the bark park because your doggo is a good boy and loves the mud. We won’t judge. 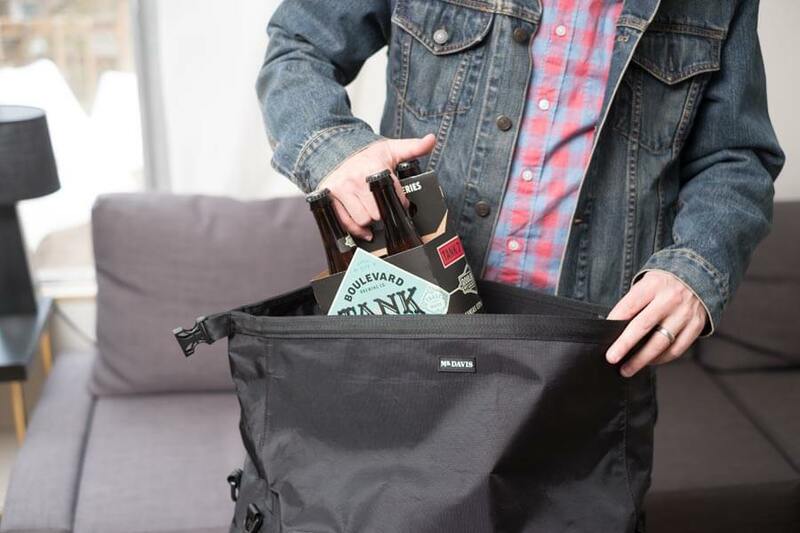 The Weekender can collapse to around 15L but expand to over 40L. If you pack sanely, it should smoosh into just about any overhead bin. Is the Weekender water resistant? The inside of the bag is coated with PVC to protect against spills and moisture. It will keep out heavy rain but if you submerge it, water will get in. The zippers are sealed to keep water out as well. Roll it tight and seal it for best results. We rarely go anywhere without a laptop, so it was a priority to make traveling with a laptop simple and easy. 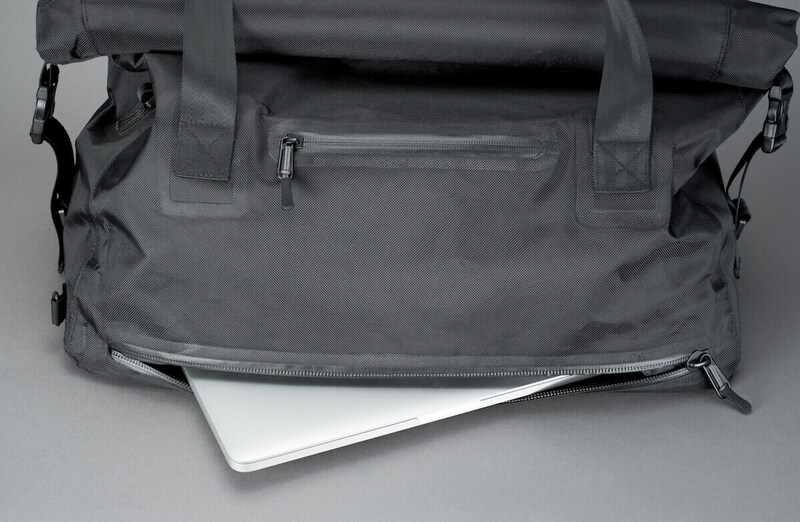 To do this we built a matching laptop sleeve that slides into each main bag . The main bag’s strap can be used with the sleeve to create the perfect on-the-go laptop bag. In Two Sizes: 13″ and 15″. As far as sizing goes, the 13″ easily fits both MacBooks and MacBook Airs, we’ve even squeezed in the new 2016 MacBook Pro into the 13″ sleeve, though we can’t guarantee this will work for all sleeves. The 15″ sleeve accommodates most newer 15″ laptops. It is a big hole of opportunity. You can fill it with whatever gives you joy. It’s plenty big enough for shoes, though we might recommend wrapping them a bit so they don’t dirty the rest of your stuff. If you are looking for more separated compartments, the Continuum is a better choice for you. Honestly though, you might want both.